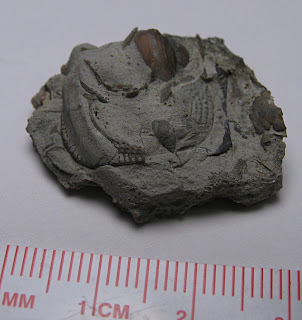 These pictures are of pieces of the Crytolithus trilobite found in the Kope Formation. The fossils were found in Carroll County, Kentucky and the trilobite existed in the Ordovician Period. They are mostly cephalon (head) plate fragments with one or two having some remnants of a glabella head piece. 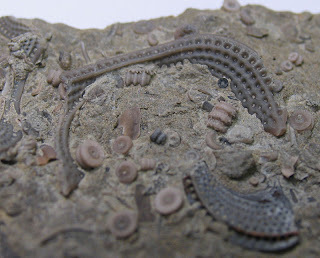 Creature existed in the Ordovician Period (about 488 to 443 million years ago) defined by the English geologist Charles Lapworth in 1879 after the Welsh tribe called Ordovices. This period occurred in the Paleozoic Era (consists of: Cambrian, Ordovician, Silurian, Devonian, Carboniferous (in U.S. Mississippian/Pennsylvanian), and Permian Periods). 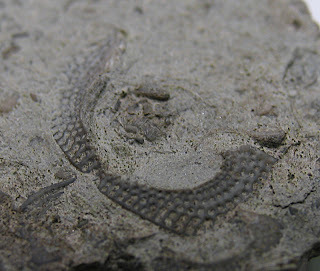 I found two papers North American Biogeography and Taxonomy of Cryptolithus(Trilobita, Ordovician) by Fredrick C. Shaw and Pierre J. Lespérance, Journal of Paleontology 68(4), 1994, pp. 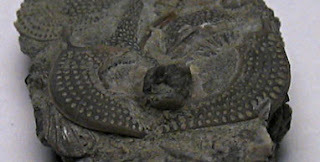 808-823 and Viola Group (Ordovician Oklahoma) Cryptolithinid Trilobites: Biogeography and Taxonomy by Fredrick C. Shaw, Journal of Paleontology 65(6), 1991, pp. 919-935 that describe the Cryptolithus in more scientific detail. They describe the habitat as being water of at least 30 meters (approximately 98 feet) in depth with muddy sediment. 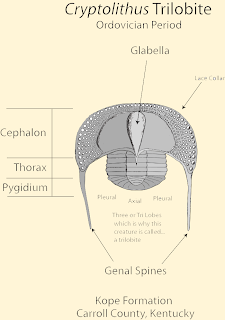 The trilobite was thought to be blind and a bottom feeder. In addition, it was isolated for millions of years in a cool water shelf like environment. 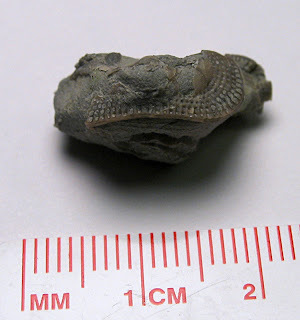 The Cryptolithus trilobite remains I find east of the Louisville, Kentucky area are in what is called the Kope Formation. I find small brachiopods, cepholopods, and crinoid stems with the Cryptolithus fossils. 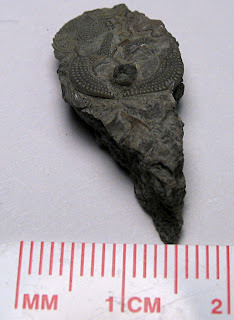 Learn more about the Cryptolithus tessellatus trilobite at the Cincinnati Dry Dredger's website.